Universal Electronics (UEIC) "Weekend Trading Portfolio Analysis"
I currently own 180 shares of Universal Electronics with a cost basis of $25.24 that were acquired February 23, 2007, just a couple of months ago. UEIC closed at $28.33 on April 20, 2007, for an unrealized gain of $3.09 or 12.2% since my purchase. When am I planning to sell? On the downside, if the stock should decline to an 8% loss or .92 x $25.24 = $23.22, then I shall be selling all of my shares. On the upside, I shall plan on selling 1/7th of my holding or 180/7 = 25 shares, if the stock should reach a 30% appreciation target, my first targeted sale, or 1.3 x $25.24 = $32.81. Thus far, in the past two months, I have not sold any shares of this holding. Let's take a closer look at this company and see if it still deserves a spot in my portfolio and whether it belongs in my blog! What exactly does this company do? 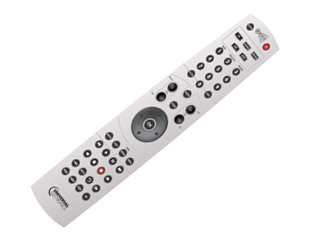 "...provides pre-programmed wireless control products and audio-video accessories for home entertainment systems. Its products include standard and touch screen remote controls; antennas; and various audio/video accessories, including digital antennas, signal boosters, television brackets, and audio and video cleaning products, as well as microcontrollers." How did they do in the latest quarter? On February 22, 2007, UEIC reported 4th quarter results. For the quarter ended December 31, 2006, net sales were $69.7 million, up nicely from $49.3 million in the same period the prior year. Net income for the 2006 fourth quarter was $5.4 million, or $.37/diluted share, up 50% from last year's $3.5 million or $.25/diluted share. This result beat expectations of analysts from Thomson Financial that were expecting earnings of $.32/share. The company also raised guidance in the same report, boosting 2007 earnings estimate to $1.13 to $1.23/share, with sales between $260 and $271 million. Apparently current expectations are at $1.09/share. The combination of strong earnings results, beating expectations, and raising guidance was the source of my original interest in purchasing shares of this company. How about longer-term financial results? Reviewing the Morningstar.com "5-Yr Restated" financials, we can see that revenue, which dipped from $119 million in 2001 to $104 million in 2002, has subsequently climbed steadily to $181 million in 2005 and $215 million in the trailing twelve months (TTM). Earnings follow a similar pattern, dipping from $.78/share in 2001 to $.42/share in 2002, however, they have climbed steadily since to $.69/share in 2005 and $.81 in the TTM. Also attractive is the stability in the outstanding shares with 14 million recorded in 2001, unchanged at 14 million in the TTM. Free cash flow has been positive but erratic with $17 million reported in 2003, $1 million in 2004, $11 million in 2005 and $9 million in the TTM. The balance sheet is solid with $57.3 million in cash, which by itself can easily cover both the $49.4 million in current liabilities and the small $100,000 in long-term debt. Calculating the current ratio, the combined current assets total $143.6 million, which, when divided by the $49.4 million in current liabilities yields a healthy ratio of 2.91. This ratio is particularly noteworth because of the virtual absence of any long-term liabilities as reported by Morningstar.com. Looking at the Yahoo "Key Statistics" on UEIC we can see that this is a small cap stock with a market capitalization of only $404.44 million. The trailing p/e is a bit rich at 30.23 but the forward p/e (fye 31-Dec-08) is estimated at a more reasonable 19.95. Thus, with rapid growth, the PEG ratio (5 yr expected) is 1.16. I like PEG's that are between 1.0 and 1.5 as being 'reasonably priced'. UEIC fits the bill! Another aspect of valuation is Price/Sales. I always like to credit Paul Sturm from Smart Money who wrote a great article on using the Price/Sales ratio by comparing it to other companies in the same type business. In this case, Universal Electronics is reported to have a Price/Sales ratio of 1.66 which is actually higher than the industry average of 1.17, meaning the stock is priced at a premium to similar companies in the same industry. Looking at Return on Equity as a measure of profitability, UEIC comes in close to the average at 11.14%, with an average ROE (TTM) in its industry recorded at 11.29% by Fidelity. Finishing up with Yahoo, we can see that there are 14.28 million shares outstanding and 14.13 million that float. There are 688,580 shares out short as of 3/12/07, representing 3.4 trading days of volume (the short ratio). I use a 3 day cut-off for 'significance' in this ratio. So this is borderline significant...with more shares out short being a bullish factor. No dividends are reported and the last stock split per Yahoo was a 2:1 split in February, 2000. Examining the "Point & Figure" chart on UEIC from StockCharts.com, we can see what appears to me to be a "cup and handle" chart pattern, which usually is recorded in a 'bar chart'. In any case, the stock which has been consolidating for almost three years between the $15 and $18 level, appears now to have clearly broken-out to the $29 level. The chart looks encouraging to me. Summary: What do I think about this stock? I still like this stock and still rate it a "buy". I do own shares now so that should be taken into consideration. However, the latest quarter was very strong, with both earnings and revenue growth and the company exceeding expectations on earnings. In addition, they raised guidance on future revenue. The Morningstar.com report looks solid with steady revenue and earnings growth the past several years, maintenance of a steady number of shares outstanding, free cash flow generation, and a solid balance sheet. Valuation-wise, the PEG is below 1.5, but the Price/Sales is a bit rich relative to similar companies, and the ROE is fairly average. Finally, the chart looks encouraging. Thanks again for visiting my blog. If you have any comments or questions, please feel free to leave them right on the website or email me at bobsadviceforstocks@lycos.com. If you get a chance, be sure and visit my Stock Picks Podcast Website where I discuss some of the stocks that I have written about here on the blog. It is another weekend and another opportunity to look back at past stock selections on this blog. As I like to point out on these reviews, my evaluations assume a "buy and hold" strategy on each stock purchase, with equal amounts of money used to purchase each of the stocks held that week. Of course in reality, I purchase only a very small number of stocks that I discuss on this blog. I refer to my actual purchases as part of my "Trading Portfolio". Those purchases are real transactions. The rest of my picks are just stocks that I view as "investable" and they become part of my 'candidates list' or as I refer to them, part of my "vocabulary" of investing! In practice, I employ a very disciplined portfolio management approach to all of the stocks I own. I do not use a buy and hold strategy at all in reality. I sell my losing stocks quickly and completely and sell my gaining stocks slowly and partially at targeted appreciation points. This difference in strategy would certainly affect any performance (as has been pointed out to me multiple times), and should be taken into consideration when reading these reviews which assume this 'buy and hold' approach which I use for this review simply because it is easier to evaluate performance without a real-time reconstruction of price movement required by a disciplined portfolio strategy. On December 7, 2005, I posted Hurco Companies (HURC) on Stock Picks Bob's Advice when it was trading at $27.33. Hurco closed at $42.77 on April 20, 2007, for a gain of $15.44 or 56.5% since posting.
" As you know, on September 4 th , Veritas and CGG signed a definite agreement whereby CGG would offer Veritas shareholders the equivalent of $37 in cash plus 1.14 CGG ADS per Veritas share. At the time of the announcement, this represented a 35% premium to Veritas’ previous 30-day average share price of $55.69. This agreement was anonymously approved by both CGG’s and Veritas’ board of directors. We are in the process of filing various documents with the regulatory and stock exchange authorities. On September 25 th , we made our ... filing and expect that the Form F-4 will be filed with the SEC and the ... will be filed with the French AMF in the next two weeks. Other country filings are ongoing." Trying to reconstruct the current value of the acquisition, with Compagnie Gnrale de Geophysique-Veritas trading at $41.61 on April 20, 2007, this would give the value of that acquisition at $37 + (1.14)($41.61) = $37 + $47.43 = $84.43. This would have meant a gain of $47.15 or 126.5% since posting. Here is the "Point & Figure" chart on VTS up to the last day of trading as an independent company in January, 2007. So how did I do with these two "picks" from December, 2005. In a word phenomenal! Hurco was up 56.5% since my post, and VTS climbed 126.5% with an acquisition! This was an average gain of 91.5% on these two stock picks. This is an unusual week even for me. The past couple of reviews have shown negative returns, so do NOT expect this is typical! However, it is nice to have a couple of good picks, isn't it? I hope you all have a great weekend! If you have any comments or questions, please feel free to leave them on the blog or email me at bobsadviceforstocks@lycos.com. Also, feel free to drop by and visit my Stock Picks Podcast Website where I talk about some of the many stocks I have looked at here on the blog! On a day like today it is easy to forget that investing is a dangerous game. That a loss is also just around the corner. That on a day when even an amateur blogger looks brilliant, it is easy to forget that 'what goes up may go down'. There have been plenty of books written about investor psychology. The muse that is the stock market has attracted many investors. 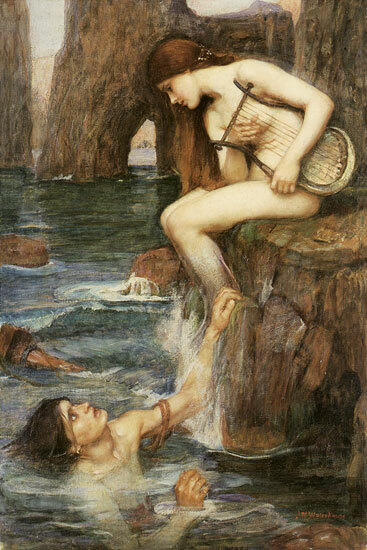 Or perhaps it is like a Siren as in this painting by John William Waterhouse, seducing the unwary sailor to his doom with the lure of something other-worldly. In any case, as I have written many times, it is imperative for the investor, especially the new investor, to invest in a calm fashion, to avoid being seduced by the lure of easy riches, fast gains, and money to be taken without sacrifice. It isn't like that at all. For those of you who have recently become enthralled with the market, beware her siren call. Respect the risk that she presents. Learn from her and above all do not fall head-over-heels into a swoon that may well lead to your financial destruction. Do I sound gloomy enough? Having a realistic strategy in dealing with the market and your investments is necessary for success. When initially getting involved in the market, move slowly, commit only small amounts of funds into a new venture and give yourself time to consider what is really happening in the investment world. If you feel like the stock market is getting away from you, or a stock you had seen is moving higher without you, do not panic. Do not chase that siren, she may well fall under her own weight. You do not need to own every single stock that climbs to do well in the market. You need to monitor your investments closely, understand your planned course of action in the event of every possible outcome, and then implement that action as the time to deal with your investments arises. It is essential to have a calm mind when investing. To avoid excessive euphoria when stocks rise and the same amount of 'depression' when the stocks move against your interests. Stocks and the market do not know you exist. They live and breathe almost like a living organism. Stocks will not rise because you have sold them, nor will they fall because you have purchased them. Stocks simply don't care. So if you are a new investor, do not get overly enthusiastic when things are working right. Consider yourself lucky, examine your plan, and determine your response. Above all, stick with your rules that you made when you were calm inside and anticipating whatever the market might deliver you. Satyam Computer Services (SAY) "Trading Transparency"
As I just wrote up on my last entry, my Coach Stock (COH) has been an absolutely phenomenal performer in my portfolio. The stock hit an appreciation target and I sold 1/7th of my position. Being under my maximum (my new level) of 20 positions, I thus had a "permission slip" to add a new position to the mix. And you know how I love to buy stocks! Anyhow, checking the list of top % gainers today, I immediately saw a stock that I recently reviewed, Satyam Computer Services (SAY), trading at $25.81, up $1.87 or 7.91% on the day. The company released earnings early today that showed revenue up 36.7% from a year earlier and earnings up 38.6% for the quarter as well. This strong performance was enough to get the stock onto the top % gainers list and was enough to get my attention as well! I often talk about the 'vocabulary' of stocks in making investing decisions. Having a bunch of 'candidates' that are 'investable' helps me make a relatively quick decision as I did. These decisions aren't always successful as my recent sale of Medtox demonstrates, but it helps being an informed investor. And that is what my homework is all about! Thanks so much for dropping by! If you have any comments or questions, please feel free to leave them on the blog or email me at bobsadviceforstocks@lycos.com. If you get a chance be sure and visit my Stock Picks Podcast Website where I talk about some of the stocks I have been writing about here on the blog. A few moments ago I noticed that my remaining 71 shares of Coach (COH) had hit a new sale point and I sold 10 shares of Coach (COH) (1/7th of my position), at $53.41. These shares were acquired 2/25/03 at a cost basis of $8.33/share, so I had a gain of $45.08 or 541.2% on these shares. This was my tenth (!) partial sale of Coach, and using my own idiosyncratic system of selling at targeted appreciation points, I have sold at approximately 30, 60, 90, 120, 180, 240, 300, 360, 450, and now 540% appreciation levels. When would I sell more shares? Since I am up to the eleventh partial sale level (where I have never been before), my goal would be to sell 1/7th of my remaining shares should the stock appreciate to a 630% appreciation level. I am going by 90% intervals as this is my third group of four sales. I hope you follow this. Thus, since my basis is at $8.33/share, the next targeted sale on the upside would be at 7.3 x $8.33 = $60.81. On the downside, I plan on selling if any 'bad' news should be reported, otherwise, if Coach retraces to 1/2 of the highest % sale at a gain, which works out to a 315% appreciation level or 4.15 x $8.33 = $34.57, I would sell all remaining shares. One of the unfortunate aspects of selling any shares in Coach is that this is the strongest stock in my portfolio. This is compounded by my early 1/4 position sales which reduced the size of the position significantly. Hopefully, as I have now switched to the 1/7th position sale at the same targeted appreciation levels, we shall find that both the size of the portion sold as well as the remaining value of the holding should continue to grow over time. Thanks so much for stopping by and visiting! If you have any comments or questions, please feel free to leave them on the blog or email me at bobsadviceforstocks@lycos.com. P.S., since I am at 19 positions, and under my NEW MAXIMUM of 20 positions, that 'nickel' is burning a hole in my pocket already! Hello Friends! Thanks so much for stopping by and visiting my blog, Stock Picks Bob's Advice! As always, please remember that I am an amateur investor, so please remember to check with your professional investment advisers prior to making any investment decisions based on information on this website. "...and its subsidiaries produce fabricated metal products; metal and concrete pole, and tower structures; and mechanized irrigation systems worldwide. The company operates through five segments: Engineered Support Structures, Utility Support Structures, Coatings, Irrigation, and Tubing." It was the announcement of 1st quarter 2007 results yesterday after the close of trading that pushed the stock price higher today. The company announced that for the quarter ended March 31, 2007, sales came in at $340.7 million, up sharply from sales of $303.6 million in the same period last year. Net earnings were $18.7 million, up from $13.1 million or $.72/diluted share, up from $.52/diluted share in the same period last year. The company beat expectations of $.63/share per Thomson Financial. Checking the Morningstar.com "5-Yr Restated" financials on Valmont, except for a dip in sales from $855 million in 2002 to $838 million in 2003, sales have steadily grown to $1.28 billion in 2006. Earnings also dipped from $1.37/share in 2002 to $1.05 in 2003, then resumed their climb going up to $2.38/share in 2006. The company has been paying dividends during this time, increasing it intermittently from $.29/share in 2002 to $.37/share by 2006. The shares outstanding has been fairly stable, increasing only from 24 million in 2002 to 26 million in the trailing twelve months (TTM). Free cash flow has been a bit erratic as well with $(12) million reported in 2004, improving to $99 million in 2005 and pulling back to $31 million in 2006. The balance sheet appear solid with $63.5 million in cash and $431.2 million in other current assets. This total of $494.7 million in current assets, when compared with the $216.9 million in current liabilities yields a healthy current ratio of 2.28. In addition, the company has $274.1 million in long-term liabilities as reported by Morningstar. Checking the Yahoo "Key Statistics" on Valmont Industries, we find that this is a mid cap stock with a market capitalization of $1.64 billion. The trailing p/e is a moderate 26.88 with a forward p/e of 18.54 (fye 30-Dec-08) estimated. Thus, the PEG comes in at a reasonable 1.24. (5 yr expected). Using the information from the Fidelity.com eresearch website, we can see that the Price/Sales (TTM) comes in at a reasonable 1.11, when compared to the industry average of 1.39. In terms of profitability, the company was a little less than the average of 23.33% Return on Equity, coming in at 17.04%. Finishing up with Yahoo, we can see that there are 25.66 million shares outstanding with only 17.18 million that float. As of 3/12/07, there were 1.52 million shares out short representing 9.6 trading days of volume. With the announcement of strong earnings last night coming in ahead of expectations, there was likely a bit of a short squeeze today, as the short-sellers scrambled to buy shares to close-out their positions. The company traded over 1.1 million shares today, more than five times the usual volume of 179,883 shares/day. As I reported above, the company does pay a dividend with a $.38/share forward dividend yielding 0.7%. The company last split its stock 2:1 back in June, 1997. 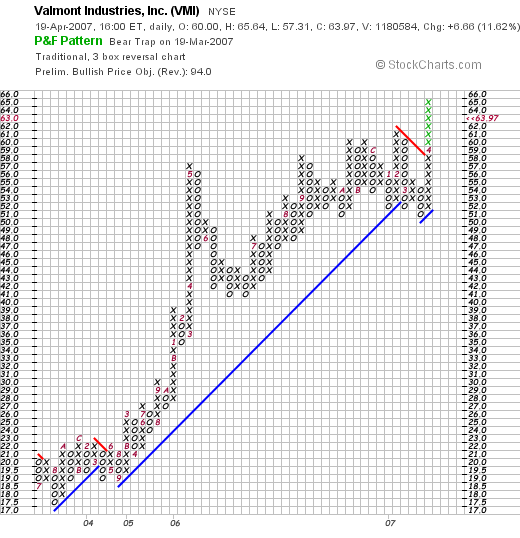 Reviewing the "Point & Figure" chart on Valmont from StockCharts.com, we can see that except for an apparent breakdown in support for the chart in March, 2007, the company now with the sharp rise in price, is again well above its support line, having broken through the short-term area of resistance. That means simply, that while the chart recently showed a bit of a struggle, the company stock appears to be moving higher without difficulty at this time. Summary: What do I think? I like this stock. The company moved strongly higher today in a relatively anemic market. The company reported strong earnings last night and beat expectations. They have a strong record of steady revenue, earnings, and dividend growth the past several years while maintaining a relatively stable number of shares. Free cash flow is positive, the balance sheet is solid, and valuation is reasonable with a PEG under 1.5, a Price/Sales low for its group, and a Return on Equity that could be a bit stronger, coming in below the industry average. Finally, the chart looks strong and the significant short interest may well support further price appreciation. Thanks so much for stopping by and visiting! If you have any comments or questions, please feel free to leave them on the blog or email me at bobsadviceforstocks@lycos.com. If you get a chance, be sure and drop by my Stock Picks Podcast Website, where I get a chance to talk about many of the same stocks I write about here on the blog. A Reader Writes 'What is a good PEG ratio?" "What is a good PEG ratio? P/E ratio? What should a good EPS be and is this ratio even worth looking at? Eric, thanks again for writing. Before we can say what is a good ratio for the PEG ratio, let's review what it is. The PEG ratio is the comparison between the P/E ratio and the Growth rate. For the Yahoo numbers that I use, this is based on 5 yr expected earnings. Thus, if the p/e is 10 and the growth rate is 5%/year, then the PEG would be 10/5 or 2.0. *Includes U.S. companies trading on major exchanges with market caps greater than $500 million for which data was available. Even from this chart we can see that there is a wide variation between PEG ratios and return on an investment. Simply put, a stock with a low PEG ratio is in general a better "value" than one with a high PEG ratio. Insofar as p/e ratios are concerned, here is another article you might wish to read. Simply put, p/e's that are 'low' are better values than stocks with p/e's that are 'high'. Each investor may have different tolerances to different p/e's. As you invest and gain experience, examine these ratios, and observe how the stocks perform later. Finally, what about EPS? EPS just stands for "earnings per share". This particular number is rather meaningless when taken out of context. That is, it is important to know the price of a stock to determine what the value of the earnings is to the stockholder. Also, it is the change in earnings that often determines the stock price. And even more so, it is the expected earnings that will drive a stock higher or lower. There isn't any particular absolute EPS on anything really. I hope this helps a little. Be sure and read some basic texts on investing to give you some more insight on all of these numbers. Let me know how things are working out! MedTox Scientific (MTOX) "Trading Transparency"
A few moments ago, checking my portfolio, I saw that my MedTox stock (MTOX) that I had bought yesterday (!) was down sharply and passed my 8% tolerance limit. I sold my 210 shares at $18.81 that I had purchased at average cost of $20.74, thus, the sale represented a loss of $(1.93) or (9.3)% since purchase. I have said it before, and I will repeat what I have written, I don't care how long I hold a stock. If it hits my sale points on either good or bad news, I shall implement the indicated trade. The irony of the situation is that MedTox reported good earnings! In general, I have had greater luck buying stocks AFTER reported news and not just before they report. It is common in the market for stocks to sell off after a good announcement and to rise in anticipation. I didn't execute this trade very well at all! In any case, I am now back to 19 positions. 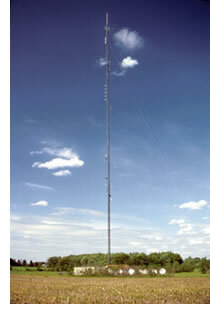 The good news is that I can now buy a new position if I get the right signal. Under my maximum of 20 positions which I recently discussed. Thanks so much for dropping by! If you have any comments or questions, please feel free to leave them on the blog or email me at bobsadviceforstocks@lycos.com. Too Much Margin! Rethinking my Portfolio Goal! I have written extensively about building portfolios and waiting to develop the cash to add a position. It is time for me to live up to my words. I am now at 20 positions in my Trading Account. I want to pause to let my cash sales on gains start paying down the margin load rather than adding more margin to the account. Let me explain. Currently my 20 positions have an equity value of $123,214.30. My margin value is a hefty $69,140.72. My net value of my account is at $54,073.58. There is no doubt in my mind that my strategy overall has thus far been successful. My portfolio is full of unrealized gains. In fact these paper profits total $39,899.05 this morning. Of my 20 positions, only two have unrealized losses: Covance (1.34)%, and Medtox (1.13)%. These are recent purchases. And my net realized gains this year total $3,850.29. I am not hiding losses in my realized trades. But what I am about is about reducing risk as well as maximizing profit potential. And margin is an anchor around my neck. It provides leverage on the way up as well as magnifying losses in times of correction. My portfolio shall remain at a 25 position goal. But for now, I shall hold at 20 positions and see if my own strategy will gradually pay down my margin. Wish me luck! I shall report back to you as I make progress (or not) on this. Thanks again for dropping by. If you have any comments or questions, please feel free to leave them on the blog. Or email me at bobsadviceforstocks@lycos.com. Jones Soda (JSDA) and Medtox Scientific (MTOX) "Trading Transparency"
Hello Friends! Thanks so much for stopping by and visiting my blog, Stock Picks Bob's Advice! As always, please remember that I am an amateur investor, so please remember to consult with your professional investment advisors prior to making any investment decisions based on information on this website. A few moments ago my Jones Soda (JSDA) hit an appreciation target at a 60% gain. I sold 35 shares of JSDA at $30.25. I now have 215 shares remaining of this stock that I purchased with a cost basis of $18.22 on March 12, 2007. This sale represented a gain of $12.03 over my purchase or 66.0% appreciation. On the upside, my next sale will be at a 90% appreciation level or 1.9 x $18.22 = $34.62 or on the downside, at half of the highest appreciation point, or at a 30% gain, I plan on selling all remaining shares. This sale point would be at 1.30 x $18.22 = $23.69. Having sold at a gain, this represented "good news" and the nickel didn't last long in my pocket. I noticed that Medtox (MTOX) was on the top % list again, currently trading at $20.88, up $1.28 or 6.57% on the day. I went ahead and purchased 210 shares at $20.69. Wish me luck! Thanks again for visiting. I shall try to keep you posted as things move along. If you have any comments or questions, please feel free to leave them on the blog or email me at bobsadviceforstocks@lycos.com.